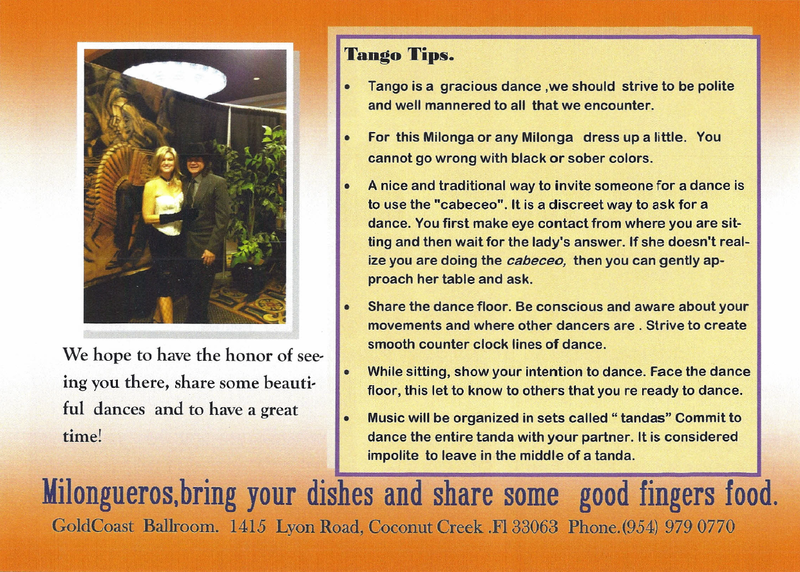 Goldcoast Ballroom & Event Center | MILONGA DE ENSUEÑOS PARTY - Argentine Tango + More - Saturday October 18 - 9:00 PM - 2:00 AM!! MILONGA DE ENSUEÑOS PARTY - Argentine Tango + More - Saturday October 18 - 9:00 PM - 2:00 AM!! Hosted by our Instructor F. Angel and Connie R.
Admission only $13.00 (including FL Sales Tax)* for the Entire Evening! 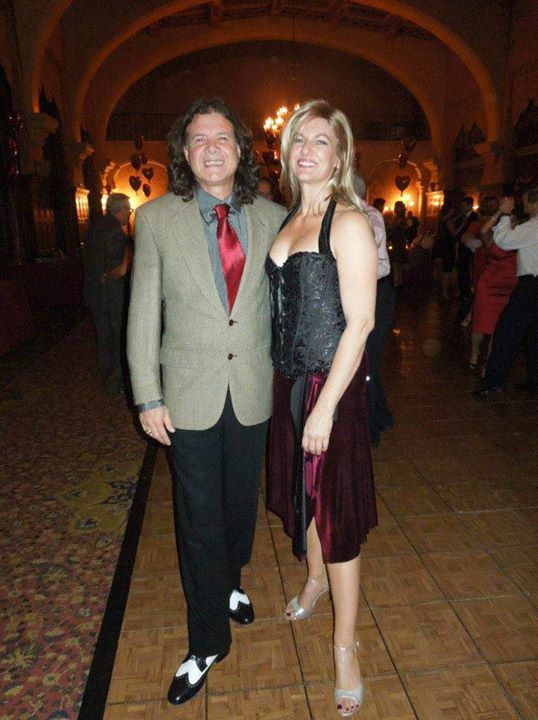 Evening Admission includes the Free Dance Lesson and admission to the Milonga de Ensueños dance – for the entire evening! An optional light evening meal (including a choice of salad or sandwich and hot beverage), served until 10:00 PM, can be purchased separately at the price stated above. And, our bar is open; purchase your choice of wine, beer, champagne, soda/ soft drinks, and more! 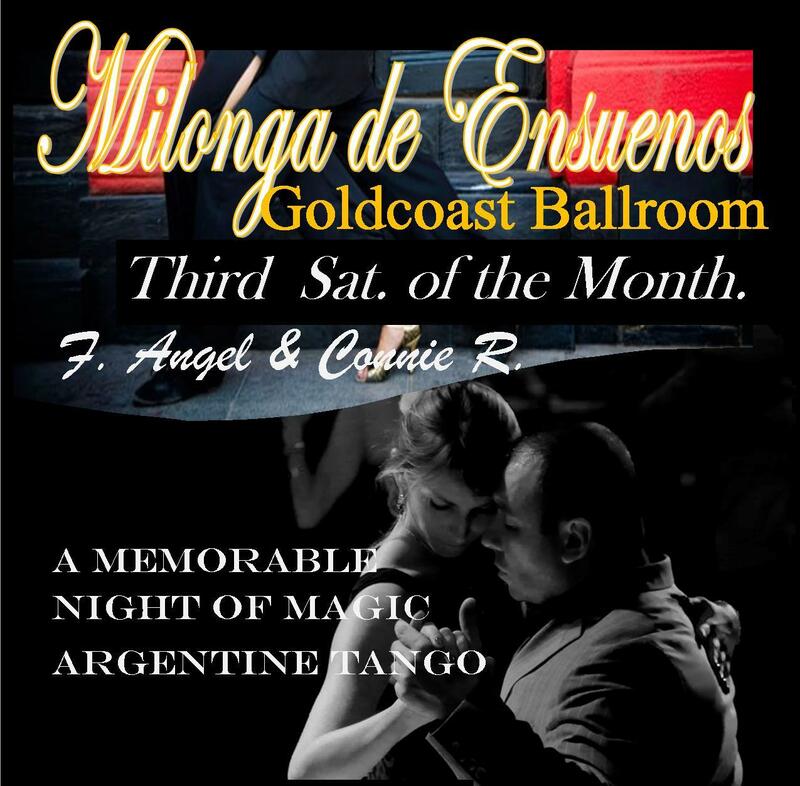 Join us for our Milonga de Ensueños Party – Every Third Saturday of the Month at Goldcoast Ballroom! “Milonga de Ensueños” = Tango Party of Your Dreams & Fantasies! An Exciting Evening of ARGENTINE TANGO — a most romantic, passionate, intriguing, enigmatic and sublime of all dances! Plus some Salsa, Merengue and West Coast Swing! Learn more about Argentine Tango – including Music & Video Samples of Argentine Tango – and other dances on our “Resources > Learn About Dance” pages. 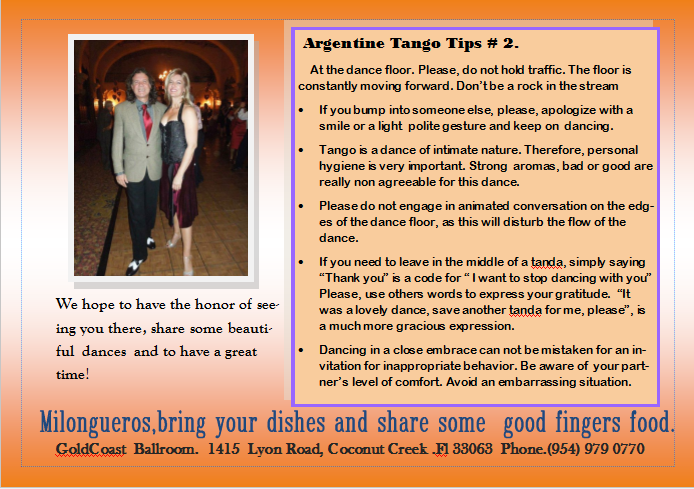 Read some interesting tips below on Argentine Tango and Tango Manners & Etiquette, written by F. Angel. You may be surprised to learn that Tango Etiquette differs from accepted Etiquette for other dances!